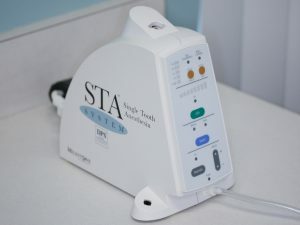 The STA is also great for giving painless injections. This device delivers anesthetic at a computerized-controlled rate below the sensitivity level of pain. This is truly a state-of-the-art way for delivering comfortable anesthesia leading to greater comfort and satisfaction. What was once a cause for anxiety has now become a reason for patients to refer their friends and family to our office!